SPECIAL FEATURE: Murray did not have the talent that the likes of Federer, Djokovic or Nadal had but he wasn't short of it either. Ask fellow players on the ATP tour, who the funniest player is and there will be two winners. One is the enigmatic and wonderfully unpredictable Frenchman Gael Monfils, and the other is Andy Murray. So, upon Murray’s emotional retirement plans being announced in Melbourne ahead of the Australian Open, tennis is not only losing a champion but a champion bloke. If the Australian Open is to be ‘Muzza’s’ last hurrah Down Under then there will not be a dry eye in the house. After all one of Andy’s favourite tournaments is the one at Rod Laver Arena, the scene of five previous final appearances. In truth, the debilitating hip injury which struck Murray 20 months ago always looked like being a step too far for a comeback. But herein lies the indomitable character and spirit of a man who has had to deal with expectation and adversity since a young age. We should not forget about the Dunblane tragedy before the first seeds of a tennis superstar were born. Both Andy and Jamie Murray narrowly avoided the Dunblane shootings in 1996. Andy was walking to the school’s gym when shots rang out and 16 pupils and one teacher were shot dead by Thomas Hamilton. When Murray spoke about the Dunblane massacre in a 2013 BBC documentary he emotionally recounted how hard it was for his hometown but also the pride in how the town had recovered. Despite being a multi millionaire and a sporting superstar, Murray has never forgotten his roots. I remember watching Andy Murray’s first rise to tennis superstardom on his 2005 debut appearance on Centre Court at Wimbledon in the third round. He took two sets off the gnarled Argentinian warrior and former finalist David Nalbandian. If it weren’t for fatigue born out of an equally impressive performance against Czech Radek Stepanek in the previous round, Murray’s giant killing would have continued. Just 18 years old, Murray in his own words ‘felt like he belonged there’. Importantly, behind the juvenile and at times naive exterior was a fiercely competitive desire to improve and be the best he could be. Like any 18 year old, the naivety and ignorance was there in spades. Sadly for Andy, this was played out in front of a brutally expectant British public and for a time, me included; not many took to Murray’s persona. The way Murray turned around a typically critical British public opinion was perhaps one of his greatest achievements. We British tend to focus on what our superstars do wrong instead of what they do right. We will come to his incredible tennis record in a moment, but to understand his legacy is to understand the pressure he felt in those early years going onto court. Like Tim Henman, Murray knew that the expectation come the June and July months would rise to ridiculous levels. Unlike Henman, Murray was a bête noire with the public. Petulant comments and at times actions (for the latter, on the court) did not endear himself to the public. However, like any person, the older Murray got the more mature he became. An often-perceived dour exterior was to be confused with a thoughtful and shy character that hated the limelight. Murray turned it around through his actions on and off the court. The public started loving him from the fact that he fought to the very last ball, which so often saw Murray win from two sets to love down. Murray took an interest in tennis issues, which were previously and traditionally dusted under the carpet – namely, women’s equality in tennis. Here now was a man who, when he spoke, people listened to and for the right reasons. Kim Sears (as was) as well as his family and friends should also take immense credit. Murray did not have the talent that the likes of Federer, Djokovic or Nadal had but he wasn’t short of it either. There were few better double backhands in the game, particularly cross-court. Muzza’s passing shots were second only to Djokovic. His forehand wasn’t bad either, especially when he was serving 130 mph first serves. It would be Murray’s extraordinary conditioning and fitness that would stand him shoulder to shoulder in this era of men’s tennis. Rafa, Murray and latterly Djokovic were standout athletes. There was always one more ball that the opponent had to hit. Countless times Murray would deflate and then crush his opponent’s resolve by his never say die attitude. Lest we not forget that Murray reached the final of all four Grand Slams. Andy Murray won 45 titles on tour, of which three were major titles. An incredible record when one considers the once in a lifetime generation of male tennis players that Andy grew up amongst. His great mates, Novak Djokovic and Rafa Nadal together with the Goat (The Greatest Player of All Time), Roger Federer, were his greatest rivals. There is no question that Andy Murray would have won at least five more majors if it weren’t for this legendary trio. The fact that he found a way to win (both physically and mentally) three majors is testament to giving every last drop of blood, sweat and tears to make it happen. 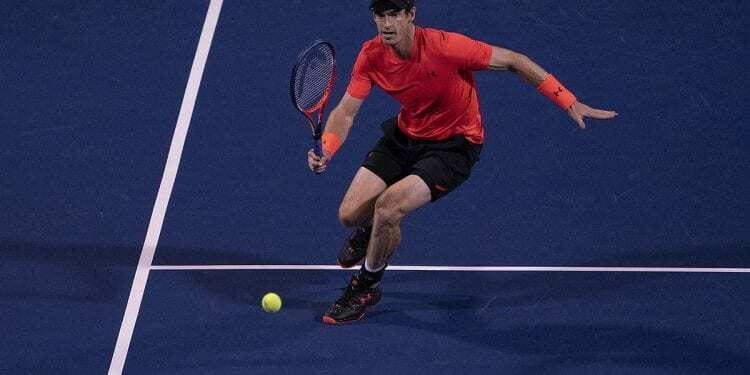 Djokovic denied him five times at the Australian Open but Murray would get his revenge when lifting his first Grand Slam at the 2012 US Open and then again at the 2013 Wimbledon Championships. Read Judy Murray’s book, ‘Knowing the Score‘ and she gives a fascinating insight to how Murray had to up his strategy, let alone his physical capabilities, to go that extra step. The list of Murray’s achievements is up their with the aforementioned three. Almost singlehandedly winning the Davis Cup for Great Britain in 2015, two Olympic Gold Medals, two Wimbledons and one US Open. Don’t forget the 14 Masters 1000 Series titles and the unforgettable 2016 ATP Tour Finals trophy. If this year really is Muzza’s last journey as a professional tennis player then tennis will be the loser. Just ask the many friends from so many different countries who rate him as a great player and as a decent bloke. In this day and age of social media and where players prefer not to go outside of their bubble, that is some testament. Then there are the million’s of fans that Murray has earned around the globe and not just in Great Britain. It is Andy Murray’s wish that he can finish on his own terms on Centre Court at Wimbledon in July. Every tennis fan, player and administrator alike will hope that can happen. No player deserves it more. Well done Muzza, you are a champion bloke and a tennis legend.